A common thread I’ve heard by people who use social media services are the concerns of how to access their archived data or what could happen if the service ceased to exist. In the case of photos and videos I personally always have local versions that are usually much higher resolution than the versions I share on services and I’d recommend everyone do that. But when it comes to using a service to create original content you don’t have on your local machine such as status updates and sharing content on Twitter or Facebook, you run into a problem. In this case you need to find ways that you can have that data backed up locally and accessible to you if the service doesn’t archive older data or makes it difficult get it. This post covers several options that include the ability to backup Twitter, Facebook and other services as well. I personally have been using the WP Lifestream Plugin on my personal WordPress blog for the last few years. This plugin allows me to import data from 40 services including Twitter, Foursquare, Facebook and even generic RSS feeds. Once you add these services it then creates individual records for every item each time it imports data. This in turn is then creating records for the data in your WordPress database. I periodically will export my WordPress MySQL database to my local machine which at that point provides me with an archive of all my social media data generated from the services I’m importing. This is a good way to do this fairly painlessly if you already have a WordPress blog. 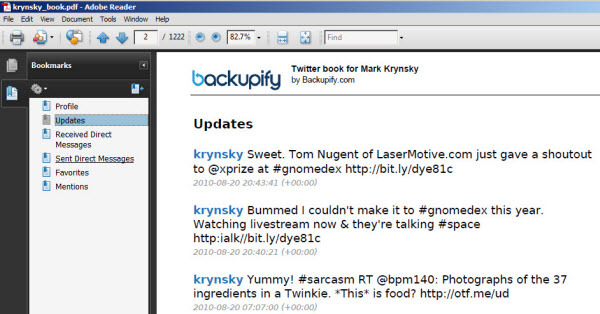 If you only want to backup Twitter then another good plugin you can use is Twitter Tools. If you are a Drupal user then there are 2 modules that are similar to the Lifestream plugin above that you can use. The first is Activity Stream which is very similar but supports a lower number of services but does include Twitter and Facebook. 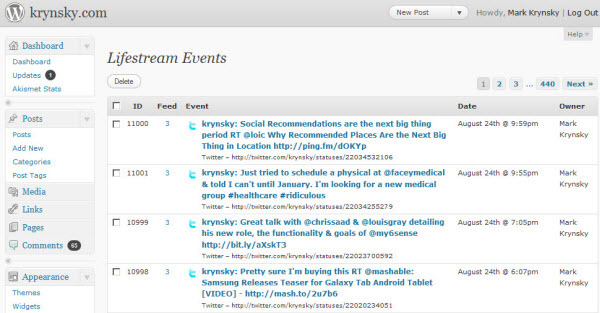 The second is Feeds which is not specific to services, just RSS feeds but is much more flexible and powerful. There are many other blogging platforms out there that I’m sure offer extensions to do this as well so if you’re not using either of these you should research similar options which should be available. This service originally started out a few years ago called Lifestream Backup with a focus specifically to backup your social media data. Besides backing up Twitter and Facebook it has since matured quite a bit and branched out to cover many other services including Gmail, Google Apps, and Basecamp. It’s really easy to setup, just create an account and link up your services. Once you’ve set up what you want to back up you can set the frequency to daily or weekly. The system will then create individual backup files of several different pieces of data from the service you connect. For instance in the case of Twitter you will get daily backups of your tweets, mentions, friends and more. The individual files are in XML format so you could open them up in a browser, editor, or Excel if you wanted to do manipulate the data. Beyond that they also offer a PDF of the backup data that provides a very nicely organized way to review your Twitter data. If you want to get a little more technical and aren’t afraid to delve into the world of RSS then you open up a whole world of possibilities when it comes to what you can do with your Twitter and any other accounts that provide feeds. Unfortunately Facebook is locked out of this method as they don’t provide any feeds of your data at the current time. One of the simpler and more powerful ways is to pull your feeds into Google Reader. This is my favorite, and arguably best RSS reader available based on the archiving, search and social features available within it. In the case of Twitter you first have to locate your RSS feed. This is fairly simple. Just login to Twitter and click on your profile link. 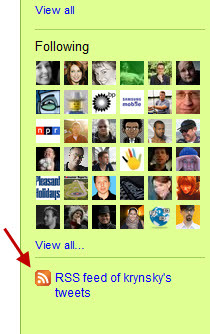 You will now see all of your tweets and if you look on the lower right hand side just below the list of people you are following, you will see that very recognizable little orange icon with a link to your RSS feed. Note that there are feeds for your tweets and favorites only but not DM’s, mentions, or retweets. Now go add that feed to your Google Reader account and now you will be archiving your tweets there and for an added bonus they will be searchable. I’m not sure of how far back they will archive your tweets but in doing a test for this post I was able to use a search term to find a tweet from December of 2008. All of the above options offer some pretty straightforward approaches but beyond them there are many other options available with varying degrees of these features in the form of software and services available for Lifestreaming. FriendFeed provides similar functionality to Google Reader with regards to archiving whatever feeds you import and allowing you to search them, although you won’t be able to export the data. Storytellr & SweetCron are open source platforms you can install yourself which similarly to WordPress will store your data as records in their database. If you want to build an engine to backup and output your data in even more flexible ways there are many Yahoo Pipes options I have found. You can see a full list of all the software, services, and tools I’ve compiled for Lifestreaming here.